This is a high-quality, easy to use 40 pin ZIF socket that is 0.6" wide with gold-plated contacts. Compatible with 0.3" up to 0.6" wide ICs up to 40-pins. Makes for easy connecting or programming to many DIP ICs. 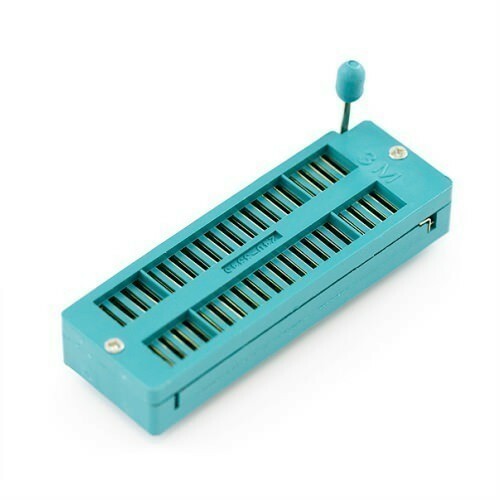 Fits up to 40-pin DIP chips, in 0.3"-0.6" width. Overall body size: 0.9" x 2.6" x 0.46" (23mm x 66mm x 12mm) - not including lever or pins. Pins are 0.6" apart (fit into a 0.6" socket) and 2.8mm (0.11") long. Also Searched as : 40 pin zif socket datasheet, 20 pin zif socket datasheet, 32 pin zif socket, standard zif sockets, pic zif socket, zif socket 18 pin, zif socket breadboard, 40 pin ide zif.